Okay I never thought that I would be here testing a product that has real flakes of gold. I'm over the moon and feel like a princess. I have to admit I feel selfish and like Gollum. I ordered this on amazon and was super surprised that it shipped so fast.When I seen the amazon box at the door it took everything in me not to rip the box open and just bathe myself... I mean try out and review Isa Professionals XANADU. It comes in a well packaged box. While opening the box i could only imagine what my facial expression was. So my initial thought was this product looks very pretty. There is a lot of suspended gold in the product. I pumped out one pump and was surprised at how many gold flakes are in just a small amount of product. The product has a low rose scent. I was very wet and a small amount spreads to cover a large area. Vitamin E that is very healing. It's great and safe to use under a primer. I applied the product 2 times a day morning and night. Please keep in mind that I have very sensitive skin and find that most products that boast safe for sensitive skin just end up bad. I am hesitant to use any product but tested on a small piece of skin first. Once i knew this wouldn't irritate my skin I would use one pump for each cheek, making sure to use my finger tips and rub the product in a circular motion. Avoiding my eyes, It was a very wet and silky texture. My skin feels more hydrated and soft after using the product for about a month. I recommend this product if you are looking for something new, it goes a long way and works on all types of skin. 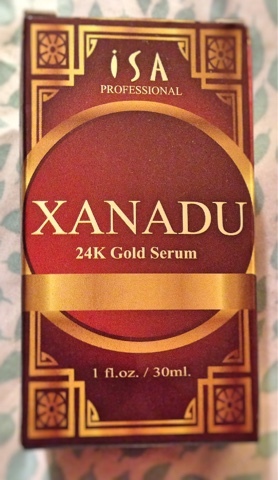 XANADU 24K Gold Serum by ISA Professional is designed to be the Best Serum for your face. Very interesting. I don't use a lot of things on my face because my skin is so sensitive. Sounds like it worked well for you. I am so glad that this product worked for you. I probably wouldn't try it because my skin is really sensitive to new products. It is always interesting to read about what works for others! I've been trying a gold serum on my face and I really love it. When I finish it I might just have to try this one as well. I have never heard of this, but it sounds really neat! I would love to try something like this! I have never heard about a product like this before, but your write up has me now intrigued! Anything that can help my face look smooth and healthy, I would love to try this and will look out for it soon! LOL. that is funny. I also had the chance to review this moisturizer and I love it. I love how it keeps my skin soft and glowing. It looks like an expensive product, but it's really not. I'm glad that it worked for you as well. WOW! I've never heard of this before, but I imagine that my face would look exactly like the GIF when I pulled it out the box! This really sounds like something that I would love to try! I've reached that age where I need a little something. You've given me a reason to check this one out. I love that it's 24k gold serum! Oh this is awesome! I didn't know that there were at home gold skin care products. I have gotten gold facial before at a spa and my skin looked amazing. I was pregnant and really needed a boost.